I'm sure those of you who have ever had shingles or the resulting PHN can certainly empathize. Day after day of burning, aching discomfort can wear on the body, mind and spirit. It's been hard not feeling like my usual, bouncy self who's always on the go doing something. I miss being able to do that. I miss me. Fortunately, I still have to eat. Since my butler and chef have a lousy work ethic and never show up to work (tee hee), that means I still have to cook. But that's okay. It may not always be easy, but I actually love it when I can muster the strength to cook when I'm sick. Because seriously, it's the best. therapy. EVER. I can get lost in the repetition of chop, chop, chopping away at an onion or slicing smoothly through a pound of ripe tomatoes. I get to gaze upon bright colors and inhale sensational aromas that waft through my tiny kitchen. Less romantically, I get to concentrate on things like not burning myself or hacking off my thumb while I debone a chicken. In short, it takes my mind off whatever is ailing me. And that is five million times more awesome than the resulting meal. After a couple of days of meals no more exciting than scrambled eggs, I decided to make something different. More nourishing. More interesting to look at, at the very least. After poking around in the kitchen, I saw I had some tomatoes that were right on the edge of becoming bad theater ammunition if they ripened any further, as well as a few veggie tails (not to be confused w/the cartoon) from an earlier chopped salad. Carrots + cucumber + peppers + a bunch of ripe tomatoes? I'd say that definitely equals gazpacho. Another one of those things that sounds ridiculously gourmet and complicated to make, gazpacho is definitely up there with Sick Person Soup in terms of ease of preparation. In fact, it's even easier than that because you don't actually have to cook anything. 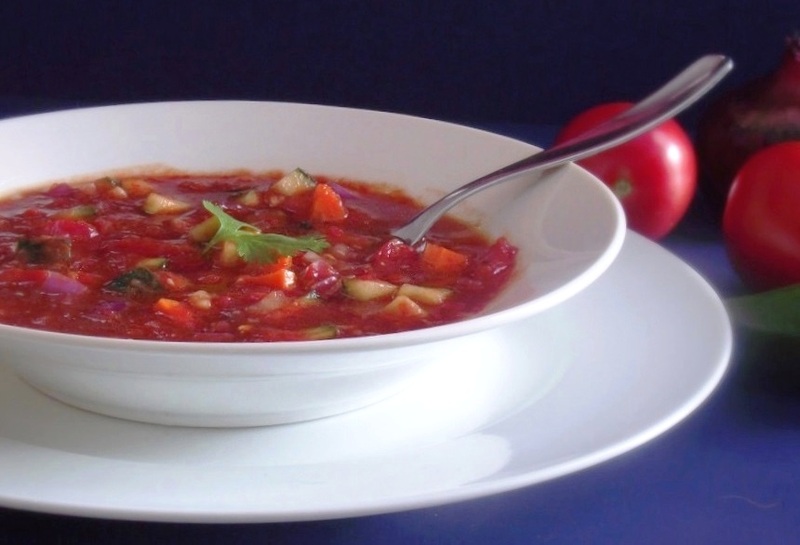 A cold soup that's usually enjoyed in the warmer months, gazpacho is traditionally made with fresh tomatoes, stale bread, garlic and olive oil. Variations of the classic version abound, as do the more interesting versions like those made from almonds, avocado, or watermelon. The way I see it, though, gazpacho is a highly customizable chilled soup, made best by the personal touches each cook adds to her own recipe. I like my gazpacho on the spicier side, so I'll add some heat by using serrano peppers and some crushed red chile flakes. Since I also like a lot of texture, I try to keep my gazpacho a bit chunkier than the norm. The juxtaposition of the crisp chunks of veggies with the smooth tomato base is an absolute party for the palate and looks just gorgeous when served. And it's beyond healthy! Between its natural beauty and all those antioxidants & vitamins from the tomatoes, gazpacho is a fabulous pick-me-up meal with zero guilt. Just one important note: if possible, use the freshest, ripest tomatoes you can find. I know this is easier said than done, especially in this year of crazy weather and confused crops. Since many tomato plants are just starting to share their fruit, it might be a little tough to find the good ones right now. But they're there if you look hard enough! Don't have a garden of your own? No worries! At the farmer's markets - and even at regular grocery stores - tomato prices are starting to go down and quality is going up, so the good ones are definitely on their way to us. 1. Dice the onion, bell pepper, carrot and cucumber (unpeeled) and place in a different bowl. Coarsely chop the tomatoes and place in a larger bowl. Be sure to reserve about 1 cup in a separate small bowl to use later. 2. Add half the onion/pepper/carrot/cucumber mixture to the large bowl of chopped tomatoes and reserve the other half. Add the olive oil, balsamic vinegar, salt & pepper and toss together. Working in small batches, puree the mixture using a blender or hand mixer until smooth. 3. Place the pureed mixture into a large bowl or pot. Add the remaining chopped vegetables, tomatoes & peppers and mix well. Check for flavoring & adjust according to taste with salt & pepper. Refrigerate for 30-60 minutes. Garnish with cilantro or chopped scallions, and enjoy! Sorry to hear you're still sick. If it's any consolation, it hasn't affected your writing or photography. Those are still in top shape. The garlic and hot peppers will help to boost your immune system as will the tomatoes. You're throwing as much good stuff as you can at it so I'll bet your health will be back soon. Just get better, one good meal at a time. 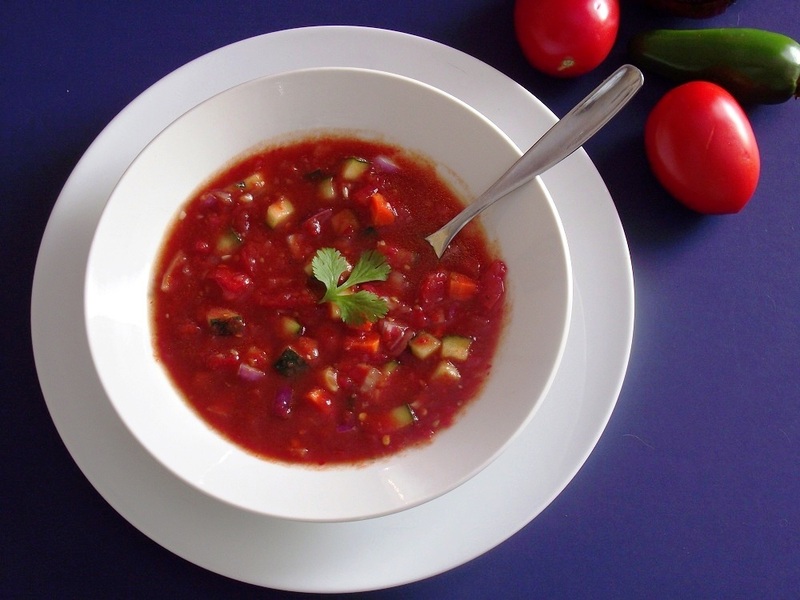 The GAZPACHO is awesome and I bet it taste as good as it looks, and having something like that is going to make you feel better soon just keep taking care of yourself and keep those recipes coming we all enjoy them. 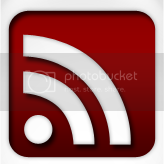 Please post a LIKE button on your page so your wonderful posts come out on facebook! You are awsome! 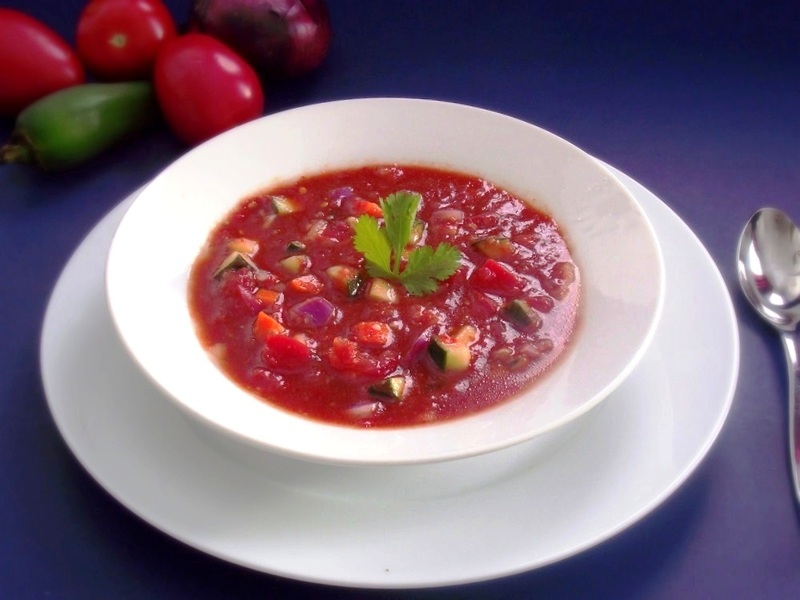 Love that there are other chunky gazpacho lovers out there! Your recipe is pretty much just like mine, except I like to add in an avocado or two. My favorite summertime treat! I made a big batch last week and now I want to go home from work and finish it off! Feel better! Do you have any suggestions for getting around the need for a food processor or hand mixer or blender? I have none of these fancy appliances at the moment, and unfortunately, my budget will not allow me to solve this. Great question, Stella! I'm actually writing a post about this very problem today, so stay tuned! And thanks for the kudos, everyone! Glad you're all liking the gazpacho!